1The College of Life Science, Chongqing Normal University, Chongqing, China; 2Key Laboratory of Eco-Environments in Three Gorges Reservoir Region (Ministry of Education), School of Life Science, South-West University, Chongqing, China. Responses to biotic and abiotic stress have been extensively studied in plants. In the current proteomic study, the cotton (Gossypium hirsutum L.) seedlings were infected with Verticillium dahliae by root-dip inoculation using suspension of fungal conidia. The different proteins were analyzed by two-dimensional gel elactrophoresis (2-DE), and flavanone 3-hydroxylase (F3H) showed a significantly up-regulation in cotton leaf after V. dahliae infection. Further research revealed F3H and the downstream genes of F3H in proanthocyanidins (PAs) biosynthesis were also significantly induced and showed coordinate expression patterns during wounding. The results indicate that PAs in cotton act an important role in response to infection V. dahliae and wounding. Proanthocyanidins (PAs), also called condensed tannins, are a class of flavanols that result from the condensation of flavan-3-ol units and are oligomeric or polymeric flavonoid end products of the flavonoid pathway . Research has shown that PAs perform many physiological functions. In plants, the major function of PAs is to provide protection against microbial pathogens, insect pests and larger herbivores . These can be mostly attributed to free radical scavenging and antioxidant activities of PAs . In our research, flavanone 3-hydroxylase (F3H) significantly increased after cotton (Gossypium hirsutum L.) was infected by Verticillium dahliae and by wounding, and further research revealed the relationship of up-regulated expression level of F3H and the biosynthesis of PAs during wounding. V. dahliae was cultured in potato dextrose broth (PDB) (200 g potato, 20 g glucose, distilled water 1 L) at 25˚C for 20 days. Germinated upland cotton seeds were grown in sterile vermiculite under artificial light (12 h photoperiod at 500 μmole·m–2·s–1) at 25˚C and watered with auto claving Murashige and Skoog basal liquid medium (MS)  every 3 days. At 4th true leaf stage, the seedlings were infected with V. dahliae using root-dip inoculation into suspension of fungal conidia . Cotton roots were slightly injured with a knife to ensure infection efficiency before root-dip inoculation. The 100 mL of a suspension of 106 conidia/mL was poured in the sterile vermiculite. The seedlings were incubated at 25˚C (12 h photoperiod), harvested at 0 h, 24 h and 72 h after inoculation and rinsed in deionized water. For wounding experiments, a strip of cotton stems were slightly scraped away using knife to simulate wounding. The samples were placed in a prechilled mortar and ground to a fine powder in liquid nitrogen. The finely ground powder (~0.5 g per tube) was immediately transferred into a 10 mL centrifuge tube and weighed, then stored in a –80˚C freezer until protein extraction. Protein extraction was carried out based on our previously established effective protein extraction method  with some modification. Briefly, the grounded sample was resuspended in 3 mL of extraction buffer (0.1 M Tris-HCl, pH 8.0, containing 30% w/v sucrose, 2% w/v SDS, 1 mM PMSF, 2% v/v β-mercaptoethanol), and then an equal volume of 1 M Tris-saturated phenol (pH 8.0) was added. The mixture was then homogenized on ice for 5 min. The upper phenol phase was collected after centrifugation at 12,000 g for 10 min (4˚C), and this extraction step was repeated once. The total phenol phase was extracted with an equal volume of the above extraction buffer. The upper phenol phase was then precipitated with five volumes of 0.1 M ammonium acetate in methanol overnight at –20˚C. After centrifugation at 12,000 g for 5 min (4˚C), the collected protein pellets were washed once with 3 mL of methanol and then washed once with 3 mL of cold 80% acetone (v/v) in water. The pellets were dried in a freeze vacuum dryer, and then resuspended in lysis buffer. The protein concentration was determined using the Bradford method  with bovine serum albumin as a standard. First dimensional electrophoresis was performed using immobilized pH gradient (IPG) on an IPGphor IEF system (Amersham Pharmacia, San Francisco, CA). The second dimensional electrophoresis (SDS-PAGE) was performed on Amersham Hoefer SE600 system (Amersham Pharmacia) with 10 mA for 1 h and 20 mA for 6 h at 15˚C. The 2-DE gels were stained using blue silver . The gels were scanned using an image scanner (Amersham Pharmacia) following the user’s manual. To control for subtle differences in sample loading and gel staining, three replicates gels per time point were performed, and the volume of each spot was normalized to generate a relative volume. Automated spot matching was performed using Image Master 2D Platinum Version 5.0 Analysis Software (Amersham Pharmacia), and significantly (p < 0.05) altered spots were identified with the Student’s t-test feature of the software. Spots of interest were cut out of the gels, and then the gel particles were transferred to a microcentrifuge tube. The gel particles were washed twice with deionized water, and 50 μl of decolorized solution [50 mM NH4HCO3/ CH3CN (1:1)] was added and the mixture was votexed for 20 min at 37˚C, repeated decolorization step until blue color disappeared. Shrink the gel particles with 50 μl acetonitrile until they become white. Dry the gels particles in a vacuum centrifuge for 10 min, and then mix the gel particles with 20 μl solution of 10 mM DTT in 25 mM NH4HCO3 for 1 h at 56˚C to reduce the proteins. At ambient temperature, the gels were dried in a vacuum centrifuge for 30 min prior to incubating with 20 μl alkylation solution (50 mM iodoacetamide in 25 mM NH4HCO3) for 45 min in the dark. The several wash step were performed as follows: 25 mM NH4HCO3 (2 × 10 min), 25 mM NH4HCO3 in 50% CH3CN (2 × 10 min), CH3CN (10 min). The gel particles were completely dried in a vacuum centrifuge for 10 min, and were enzymatic digested at 37˚C overnight with 5 ng/mL trypsin. Digested peptides were extracted with 0.1% TFA in 50% CH3CN and analyzed by Ultraflex TOF/TOF (Bruker, Germany). The results of mass spectra were submitted online to the Mascot search engine for searching against various databases . The total RNAs were extracted using a modified cetyltriethylammnonium bromide (CTAB) method . First strand cDNA was synthesized from 1 μg of total RNA using reverse transcription system (Promega, USA). 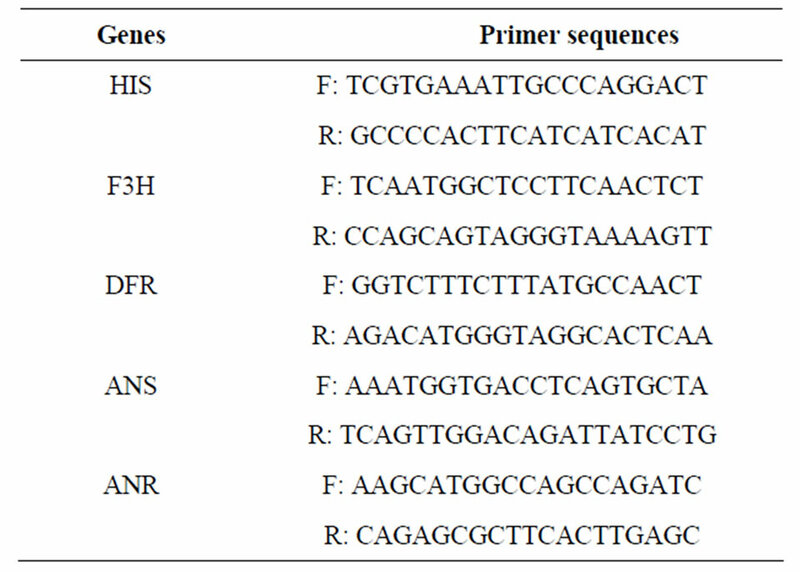 The gene-specific primers are showed in the Table 1. The quantitative RT-PCR was performed using iQ™ SYBR Green Supermix (Bio-RAD, USA) in the iQ™5 RealTime PCR Detection System (Bio-RAD, USA). To ensure reproducibility, the experiment was carried out three times. The semi-quantitative RT-PCR was performed in a 25 μl reaction mixture containing 1 μl cDNA solution and 10 μM primers. The number for PCR amplification was conducted for 25 cycles. 20 μl samples were mixed with 20 μl of DMACA reagent [0.2% (w/v) DMACA in methanol-3 M HCl (1:1)], for blanks, the samples were replaced with 20 μl ddH2O. Absorption of the mixture was measured within 15 min at 640 nm using a spectrophotometer. In order to study the interactions between cotton seedling and V. dahliae, we establish a proteomic analysis method compatible with cotton , and a well-resolved 2-DE gel pattern in the pI range of non-linear 3 - 10 was established (Figure 1(a)). Differential expression of protein profiles was analyzed at several time points (0 h, 24 h and 72 h) after cotton tissues were infected. 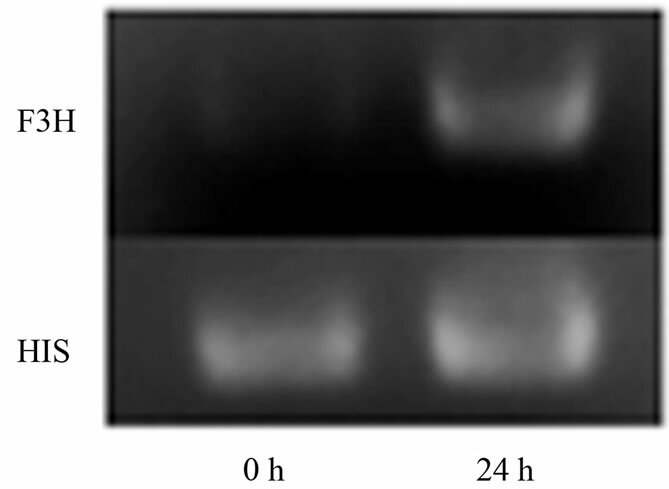 One of the different proteins showed significantly up-regulation pattern (Figure 1(b)), and at 24 h and 72 hits expression levels increased 1.8 and 2.5 times, respectively, compared with 0 h after inoculation (Figure 1(c)). The protein was identified as flavanone 3-hydroxylase (F3H) by peptide mass fingerprinting and searched on the Mascot. 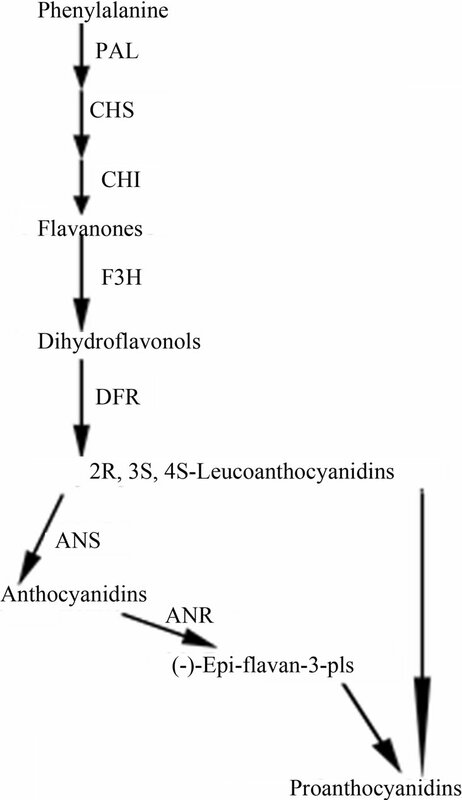 F3H is one of the key enzymes acting in the biosynthesis of flavonoids, and converts (2S)-flavanones to (2R, 3R)-dihydroflavonols that are the direct intermediates in the biosynthesis of flavonols . Several studies have suggested that F3H gene expression is associated with resistance in plant , and activity of F3H was higher in resistant cultivars than susceptible ones . Figure 1. F3H protein expression is up-regulated in the cotton leaf after the infection by V. dahliae. (a) Represents 2-DE patterns of proteins from cotton (4th leaves of seedlings) inoculated with V. dahliae (72 h). 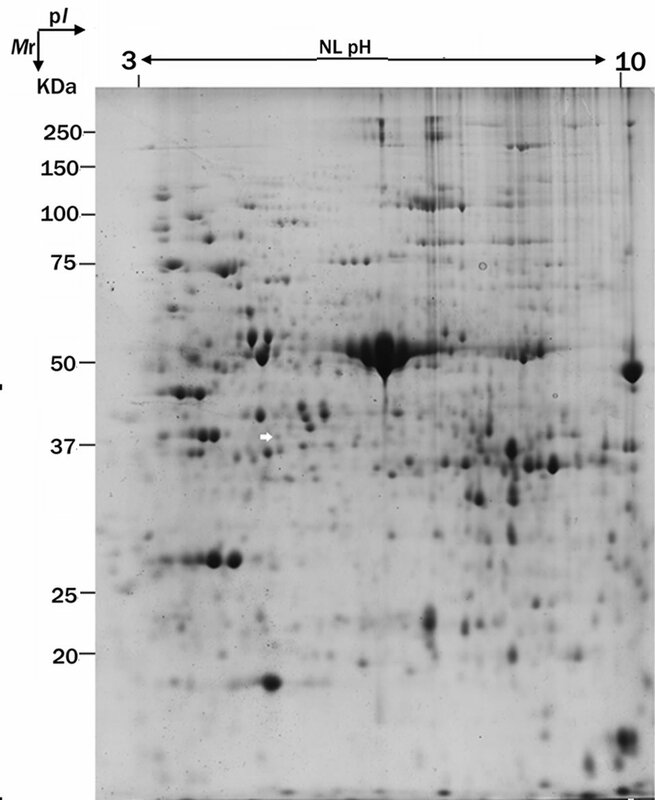 White arrow indicates the position of F3H protein; (b) Magnified views of the up-regulated F3H in the cotton after the infection by V. dahliae; (c) Average expression intensity of normalized protein was calculated, and results are mean ± SE from three independent experiments. Figure 2. Differential expression of F3H using RT-qPCR and semi-quantitative RT-PCR. 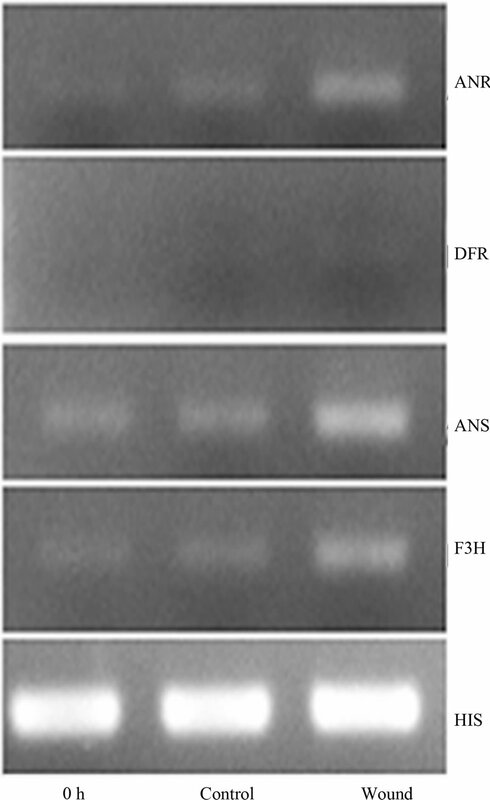 (a) Results of real-time PCR exprssion analysis of F3H gene, and F3H gene showed temporally up-regulated expression pattern after the infection by V. dahliae, and the control plants were inoculated with sterile water and harvested at 72 h; (b) Expression analysis of F3H in mock wounding leaf using semi-quantitative RTPCR, and F3H showed significant up-regulation in the leaf of wounded plant. relative expression level of F3H gene was detected by RT-PCR. The result is consistent with the hypothesis that the F3H gene can be induced by wounding, and a significant up-regulation was observed in the wounded plant (Figure 2(b)). The result clearly indicated that the F3H is a wounding inducible gene. Several previous studies have reported the F3H gene was induced by sugars  and ultraviolet-B irradiation  and pathogens [13,14]. Plants anchor to the ground through the root system for acquisition of nutrients and water, and thus are inevitably injured by any possible mechanism wound such as wind, sand, hail, and rain . Plants respond to mechanical wounding have been extensively studied, and the first identified wound-inducible defense proteins in plants include proteinase inhibitors I and II from potato and tomato [18,19]. In recent advances in plants wound signaling, the central role of jasmonic acid in plant responses to wounding is well established [17,20,21]. Furthermore, other compounds, including the oligopeptide systemin, oligosaccharides, and other phytohormonesalso play a important role in wound response . F3H showed a wound-induced gene in this study, however F3H is merely a “core” enzyme of the flavonoid pathway, and its downstream metabolic products include anthocyanins and PAs . Anthocyanins are responsible for the red, blue and purple coloration of many organs of angiosperms , and PAs play a protective function against microbial pathogens, insect pests and larger herbivores in plants . The genes, involved in F3H downstream pathway in cotton, have been cloned  (Figure 3(a)), and their expression levels were detected at 24 h after wounding by RT-PCR analysis (primers are shown in Table 1). With the exception of dihydroflavonol-4- reductase (DFR), the other two genes, anthocyanidin synthase (ANS) and anthocyanidin reductase (ANR), both showed significantly up-regulated expression patterns (Figure 3(b)). DFR is involved in multi-step reactions, and research have reported that AtDFR was not activated by PAs biosynthesis related transcription factor . The ANS catalyzes the last step in the biosynthesis of the anthocyanin from the colorless leucoanthocyanidins to the colored anthocyanidins . The ANR converts anthocyanidins to (-)-Epi-flavan-3-ols, and ectopic expression of ANR in tobacco flower petals and Arabidopsis leaves results in loss of anthocyanins and accumulation of PAs . The result of PAs content also showed that PAs transiently accumulate after wounding (the content is related to growth status of the leaf, with a younger leaf having higher content of PAs) (Figure 3(c)). We have also measured the content of anthocyanin in wounded leaves; however no significant regularity was found (data not shown). Taken together, our results imply that the up-regulated genes were involved in PAs biosynthesis. Robin et al. have showed that a transcription factor, MYB134 activats PAs biosynthetic related genes expression leading to PAs accumulation in poplar following mechanical wounding, pathogen infection, and ultraviolet B irritation. In the present study, our results suggest that PAs biosynthesis related genes were significantly induced and showed coordinate expression patterns during wounding. Figure 3. Wound-induced activation of the PAs biosynthetic pathway. (a) Schematic of the major branch pathways of PA biosynthesis. Enzyme names are abbreviated as follows: phenylalanine ammonia lyase (PAL), chalcone synthase (CHS), chalcone isomerase (CHI), flavanone 3-hydroxylase (F3H), dihydroflavonol-4-reductase (DFR), anthocyanidin synthase (ANS) and anthocyanidin reductase (ANR); (b) Expression of F3H, ANS and ANR represented significant up-regulation after the wounding treatment of cotton. RTPCR was conducted with the cotton histone (HIS) gene as a control. PCR was conducted for 25 cycles; (c) PAs in cotton leaf was temporally up-regulated after mock wounding treatment, average content was calculated, and results are mean ± SE from four independent experiments. consistent with our experiments. PAs have an extensively physiologic effect on plants, animals and human, however, the specific mechanism has been not verified. The oxidative burst generated in response to wounding can be detected at wound sites and in distal leaf veins within 1 h after wounding, and the reactive oxygen species (ROS) may been capable to induce the metabolic cascade for active defense as signaling molecule [30,31]. However, as a substrate for oxidative, they are also capable of injuring cells. Thus, the steady-state level of ROS in cells needs to be tightly regulated . Others have suggested that the PAs can help to prevent oxidative stress and may reduce ROS . Taken together, these results suggest that PAs play an important role to maintain homeostasis of plants. We are grateful to Prof. Xianming Deng (Department of Plant Protection, Southwest University, China) for the donation of the V9-strain of Verticillium dahliae and to Dr. Wangfeng Zhang (Shihezi University, China) for kindly providing the acid-delinted upland cotton seeds. This work was supported by the Natural Science Foundation Project of CQ CSTC (2009BB1123), and the Foundation for Excellent Doctor of Southwest University (kb2009018). M. Luo, Y. H. Xiao, L. Hou, X. Y. Luo, D. M. Li and Y. Pei, “Cloning and Expression Analysis of a LIM-Domain Protein Gene from Cotton (Gossypium hirsuturm L.),” Journal of Genetics and Genomics, Vol. 30, No. 2, 2003, pp. 175-182. T. A. Holton and E. C. Cornish, “Genetics and Biochemistry of Anthocyanin Biosynthesis,” Plant Cell, Vol. 7, No. 7, 1995, pp. 1071-1083. B. G. Kim, J. H. Kim, J. Kim, C. Lee and J. H. Ahn, “Accumulation of Flavonols in Response to Ultraviolet-B Irradiation in Soybean is Related to Induction of Flavanone 3-Beta-Hydroxylase and Flavonol Synthase,” Molecules and Cells, Vol. 25, No. 2, 2008, pp. 247-252. P. Reymond, H. Weber, M. Damond and E. E. Farmer, “Differential Gene Expression in Response to Mechanical Wounding and Insect Feeding in Arabidopsis,” Plant Cell, Vol. 12, No. 5, 2000, pp. 707-720. E. Nelson, C. M. Walker-Simmons, D. Makus, G. Zuroske, J. Graham and A. C. Ryan, “Regulation of Synthesis and Accumulation of Proteinase Inhibitors in Leaves of Wounded Tomato Plants,” Plant Resistance to Insects, American Chemical Society, Washington, DC, 1983, pp. 103-122.